West Windsor, N.J. – Mercer County Community College (MCCC) students enrolled in American Honors at Mercer (AH@Mercer) had a chance to share and shine during their Honors Symposium on Dec. 18 at the MCCC Conference Center. 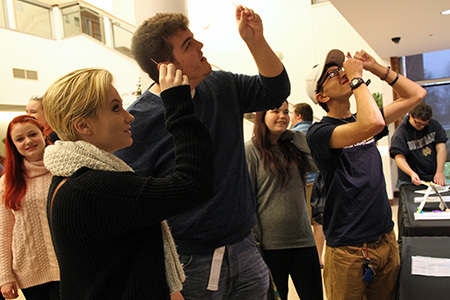 Students studying English, psychology, social science, organic chemistry, math and history presented poster and PowerPoint projects, along with interactive activities –including miniature golf! The take-away is that these students are making the most of their Honors experience – learning a lot, working collaboratively, making new friends and forging a path for future success. Freshman Zach Ciemniecki, who took Honors English and Honors Calculus in his first semester, gives American Honors a top grade. "It's a really good program. Classes are small. And the advisors help you start to shape your future,” he said. According to Dr. Gianna Durso-Finley, Professor of Sociology and Assistant Dean for AH@Mercer, "The Symposium is designed as an academic conference for students to share their work and to learn from each other. This is an opportunity for them to develop scholarly approaches in their coursework and in their presentation skills." 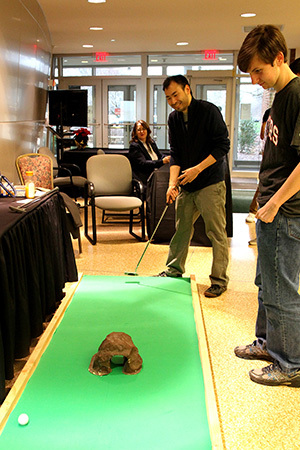 Ciemniecki and his English 101 classmates put a little muscle into their presentation, building a mini-golf putting green to accompany their poster about the book “Whistling Vivaldi” by Claude M. Steele, which they read this semetser with Professor Barbara Hamilton. Honors Organic Chemistry students were hands-on as they demonstrated experiments related to concepts they learned this semester. Admitting to a bit of fear at the start of this famously difficult course, Biology/Chemistry major Kevin Ortega said, “I figured if I was going to take the course anyway, why not challenge myself even further. We learned the same material, but doubled up on the number of experiments.” Ortega, the president of the Organic Chemistry Club, added that the course helped him stay a step ahead as club president. Jason Lima, who took Professor Laura Sosa’s Honors Global Environment of Business course, was unsure of his direction when he began at Mercer, but says this single course has gone a long way to solidifying his decision to study business. 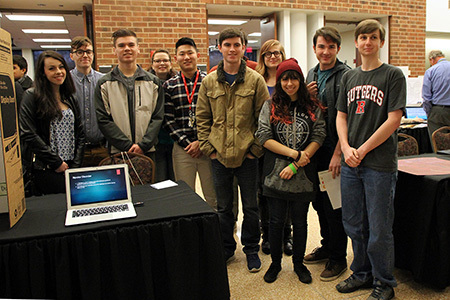 “We researched the culture, government, finances and risks associated with doing business in different countries,” Lima said, noting that the class used a sophisticated database known as GlobalEDGE. He explained that group projects gave him a taste of how teams work in the business world. Lima said a class trip to Dow Jones and Company in Manhattan really made an impression on him. "We met top executives, learned about their corporate culture, and even what they look for when they hire." Special guest for the symposium was Dr. Donavan L. Ramon, an English professor at William Paterson University, who spoke about race, stereotypes and African American literature. Miniature golf, anyone? English 101 students constucted a putting green to illustrate the findings from a book they read by Claude M. Steele. American Honors at Mercer students were ready to present, discuss and learn at the Dec. 18 Symposium. 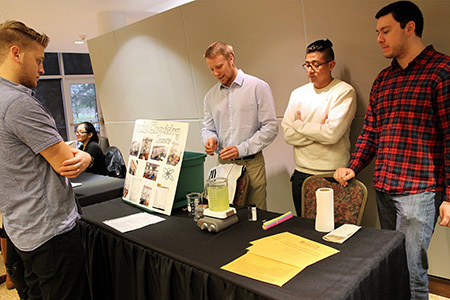 Organic Chemistry students, from left, Ron Trauger, Kevin Ortega and Diego Cuadros demonstrate chemistry magic for fellow students. What's in a slide? Organic Chemistry students share their work with classmates. 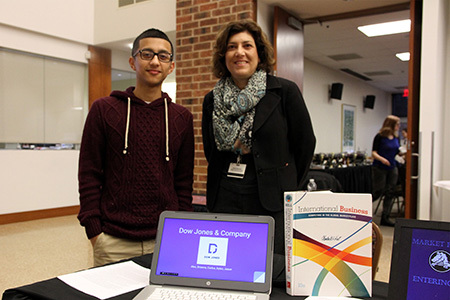 Future entrepreneur Jason Lima with faculty member Laura Sosa, Lima's professor for Global Environment of Business. 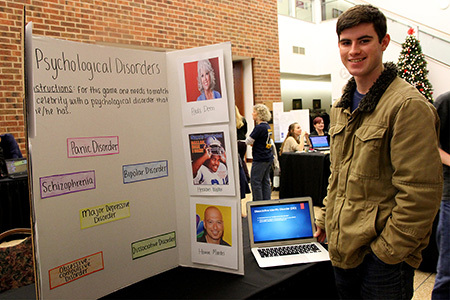 Dan Hurley with a poster from his Psychology class.